Blue Jasmine will be released in Australia on the 12th September and distributed by Hopscotch Films. Now showing in the United States and opening on the 27th of September in the United Kingdom. Woody Allen is fast approaching his fifth decade of film making and Blue Jasmine is the perfect example of how the genius film maker has still got plenty more in store for us. The combination of Allen and Cate Blanchett is one of the most exciting director and actor pairings of the year. What is more exciting is that Blue Jasmine is an instant classic thanks to the brilliant screenplay and direction by Allen and an amazing performance by Blanchett. 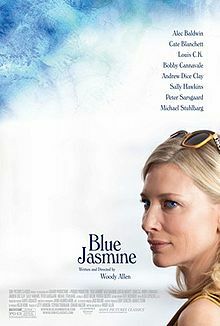 There is so much life in this film and although it is darker and more confronting than the typical Woody Allen film, it is still very funny for the most part and Blanchett's Jasmine is a character you feel you should hate, but you just love. Jasmine (Cate Blanchett) is used to living the high life on Park Avenue with her husband, Hal (Alec Baldwin). When everything falls apart for her after Hal's illegal business operations are found out, she moves to San Francisco to stay with her sister, Ginger (Sally Hawkins) and recover from her nervous breakdown. Ginger lives the opposite lifestyle to what Jasmine is used to and must make the right changes in her life to move forward. That is, if she wanted to move forward. Blue Jasmine is a much darker film than we are used to seeing from Allen. It is nastier, harshly intimate in a psychological way and more confronting. However, this does not mean that the type of humour always present in his films is a thing of the past. There are some very funny moments throughout the film and the characters have some very colourful and hilarious dialogue, particularly Jasmine herself and Ginger's boyfriend, Chilli (Bobby Cannavale). The conclusion of Blue Jasmine is many things. Many people won't like it and will feel uneasy with it, but for the most part it is unpredictable and extremely fitting for Jasmine. There is something so interesting about a protagonist like Jasmine. She is selfish, blunt, materialistic and emotionally unstable. All the qualities one should dislike in a character, but you love her. If you met someone like Jasmine on the street you would probably dislike her and want reality to hit her hard. Yet in Blue Jasmine, you cheer for her and want everything to be okay with as little pain as possible. Yes you want her to wake up to herself and realise that life isn't all Park Avenue, but you feel so much emotional attachment to Jasmine that you want to reach out and really be there for her as it seems like no one, except her sister has ever been. She is a wonderfully written character who is brought to life in an extraordinary performance by Blanchett. Blanchett completely personifies Jasmine in every way. The way she carries herself when we first meet her is that of a confident high society woman and as she unravels throughout the film, her whole physical and emotional performance changes in a scary way. Blanchett has the uncanny ability to be able to draw in the audience and allow them to feel how she is feeling. As unsettling and emotional as this performance can be, you could watch Blanchett forever as Jasmine. Brilliant. Sally Hawkins is very good as Jasmine's sister, Ginger. Ginger is also a very interesting character in herself and a complete joy to watch as she is a wonderful contrast to Jasmine. Bobby Cannavale is fantastic as Chilli. He has everything in his performance. He is powerful and intense in some emotional scenes, but can also be soft and hilarious. Alec Baldwin is also a treat. The chemistry between him and Blanchett is perfect. And is the case with Woody Allen films, the city plays it's own role in the film. Allen has a wonderful way of pouring love into the way he encompasses the location of his films, as we have seen so many times in the past with New York and more recently with European cities such as Barcelona, Paris and Rome. In Blue Jasmine, he brings so much charm to San Francisco. He shows the bohemian side of the city in perfect light, as well as showing the upper class side. Neither falters under his direction and each location in the city used is perfect for the scene in which it appears and acts as a character in it's own right. There are whispers in the air that Blue Jasmine could bring about Cate Blanchett's sixth Academy Award nomination. These whispers could be right on the money as Blanchett is divine and Blue Jasmine is wonderful. If you are in the Sydney metro area and would like to see Blue Jasmine and hear the experts talk about it, Dendy Newton is hosting a screening and media panel on the 12th of September. Blake Howard (That Movie Show 2UE and Graffiti with Punctuation), Andrew Buckle (Graffiti with Punctuation), Lisa Malouf (The Limerick Review) and Maria Lewis (The Daily Telegraph) will be talking all things Blue Jasmine, Woody Allen and Cate Blanchett and answering all your questions on each of these. Please see here for more details and to buy tickets.